Bicyclists crossing the state line from Suffield into Massachusetts last weekend. The Connecticut Department of Transportation marked a milestone Tuesday as the state Bond Commission authorized $8.3 million in bicycle and pedestrian projects, including $5.1 million to construct a missing piece of the New Haven-to-Northampton, Mass., bicycle trail in Farmington. For the first time, the DOT will wholly fund a section of a regional trail system that evolved from a series of municipal projects financed by a mix of federal dollars and local matching funds, a formula that long has frustrated advocates of mixed-use trails. The funding signifies the start of the DOT delivering on a promise to play a stronger role with the Department of Energy and Environmental Protection in the completion of Farmington Canal Heritage Trail and another major system, the East Coast Greenway. The bond authorization carries an added bit of symbolism: It is part of $17.5 million in initial funding approved Tuesday for Gov. Dannel P. Malloy’s massive transportation infrastructure initiative. Nearly half the funds are going to bicycle-and-pedestrian projects, including $1.2 million for a trail connecting western residential neighborhoods in New Haven to the downtown and Southern Connecticut State University and $1 million for a pathway to the Putnam Bridge in Wethersfield, providing access over the Connecticut River. The state is now committed to $11.2 million annually for bike trails: $10 million for construction, and $1.2 million for maintenance. Where the use of federal funds still requires a 20-percent local match, DOT now is willing to split the cost, allowing municipalities to make an in-kind contribution of planning and engineering staff time instead of putting up cash. Maziarz said the state is placing a priority on closing gaps in existing trails, such as the 2.2-mile stretch from Red Oak Hill Road in Farmington to Northwest Drive in Plainville, near Robertson Airport — the $5.1 million project. From that one-mile trail grew a major system, including a spur off the main trail that veers northwest along the Farmington River into Canton and reconnects to the main trail in Simsbury, forming a 29-mile loop. The funding scheduled to be approved today is estimated to cover the cost of paving a 12-foot wide trail on a railroad right of way owned by the DOT, construction of a bridge carrying hikers and bikers over Route 6 in Farmington, and a small parking area on Northwest Drive in Plainville. The Farmington Valley trail system runs north from New Haven to the “notch” in Suffield on the Mass., line. Other trails stretch east to Rhode Island. Green trails are complete, yellow are in design. 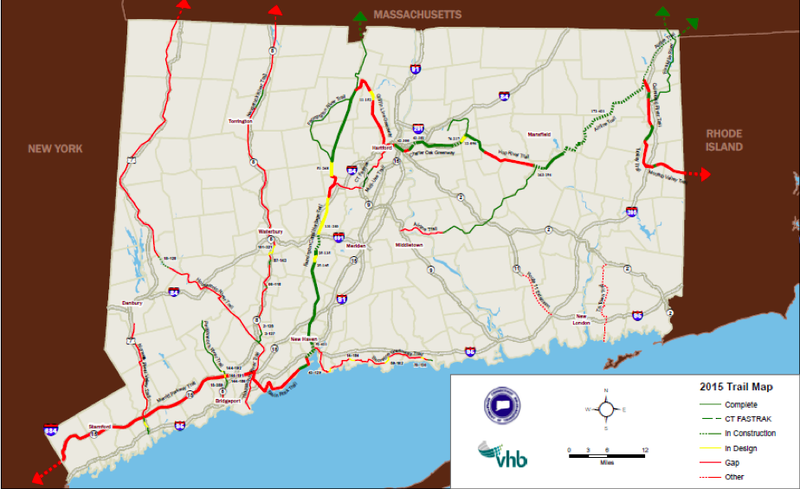 When completed, the section will give bicyclists a paved off-road path north from Plainville through Farmington, Avon, Simsbury, Granby, East Granby and Suffield into Massachusetts, with planned connections eventually to Northampton, Mass. Going south through Plainville and Southington to existing trail sections in Cheshire, Hamden and New Haven poses tougher design issues. In Plainville, for example, the right of way never was abandoned and still is used by a freight line, Pan Am Southern Railway. The Capitol Region Council of Governments is now seeking an acceptable route in Plainville. A design is expected late next year for a missing section in Southington. The limits to the federal-local funding mix were best demonstrated at the Salmon River in East Granby. For years, the trail dead-ended at the river, halted by the inability of East Granby, the smallest town on the trail, to provide the local match. The bridge eventually was built after private donations helped provide the local matching funds. Maziarz said the federal funds also came with significant red tape, including an expensive requirement that a bridge intended for bicyclists and pedestrians be strong enough to carry an ambulance. “That was a learning issue for me,” he said. 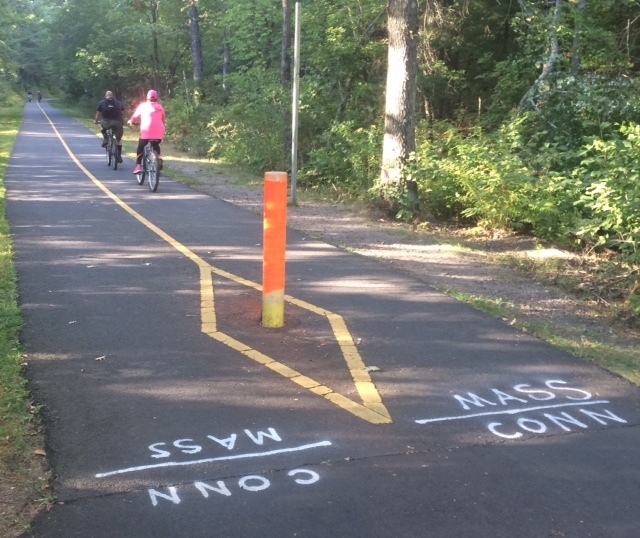 The Malloy administration has pledged to complete Connecticut’s 196-mile portion of the East Coast Greenway, a 30-year-old effort to knit together trails from Florida to Maine. Farmington Valley is a key link in the system. A five-year plan calls for a connection from the Farmington Valley trial to the east, tying into the Charter Oak system through East Hartford and Manchester, eventually reaching the Airline system that meanders into Rhode Island. Donald said the state has reached a critical mass in bike trails: The public, from serious riders to walkers to parents with young children, see the benefit. In the Farmington Valley, infrared trackers count 300,000 users annually. “I think what finally tips the scales, so many of these orphan trail systems got connected, and that connection from town center to town center to town center is what swayed even the worst skeptics,” Donald said. Glassman said she was convinced of the success of the concept more than 25 years ago, when Simsbury still had but one mile of trail along Iron Horse Boulevard.